HYBRID LEATHER SPECIALLY DESIGNED FOR YOUR APPLE WATCH: Do you have an Apple watch? Then it\'s time to replace your wristband with this 42mm hybrid genuine leather band for iWatch Space Black Series 1/2/3 Sport and Edition. 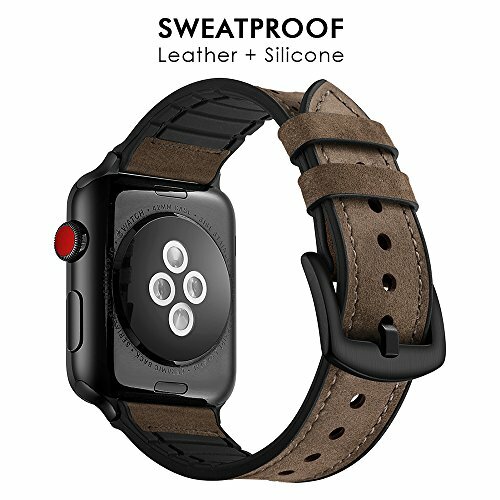 DURABLE TRIPLE LAYERED DESIGN: This 3mm thick smart watch band is made with 2 layers of genuine cowhide leather and a layer of eco-friendly silicone that ensures your comfort and the replacement strap\'s longevity. THE MOST COMFORTABLE WATCH STRAP: Adjustable, so that you can find the most comfortable and secure fit. In addition, the band for iWatch is very soft, flexible and Sweatproof, so it won\'t irritate your skin. MATCH WITH ANY OUTFIT: Whether you\'re going to work, to a fancy party or to a casual meeting with friends, in Summer or Winter, this luxurious watch band will complete your outfit and add a touch of elegance to your style. BUY THE SMART WATCH BAND WITH CONFIDENCE: The premium Apple watch band is under a 60-day money back guarantee, as well as a 1-year worry-free warranty. You will never regret this investment!